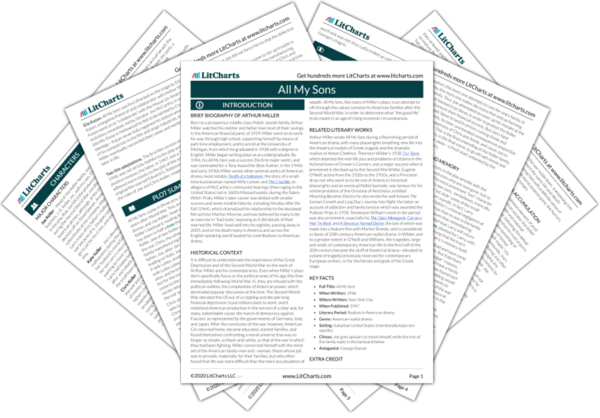 Instant downloads of all 946 LitChart PDFs (including All My Sons). A small boy from the neighborhood, Bert plays a longstanding game with Joe, attempting to “lock up” criminals in a jail Joe pretends is in the Keller family’s basement. But Kate comes out to yell at Bert, telling him that there is no prison in the house, and that Joe has “nothing to hide” there. This instance of foreshadowing indicates that, in fact, Joe does have something to hide—his involvement in the manufacturing fiasco that killed 21 pilots. The timeline below shows where the character Bert appears in All My Sons. The colored dots and icons indicate which themes are associated with that appearance. Schlegel, Chris. "All My Sons Characters: Bert." LitCharts. LitCharts LLC, 3 Apr 2014. Web. 24 Apr 2019. Schlegel, Chris. "All My Sons Characters: Bert." LitCharts LLC, April 3, 2014. 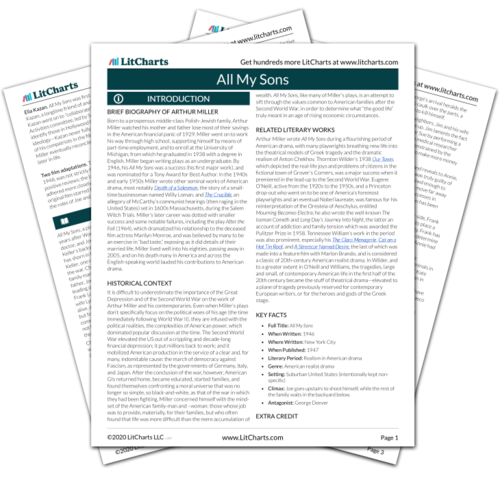 Retrieved April 24, 2019. https://www.litcharts.com/lit/all-my-sons/characters/bert.